Smoking: What’s In It For Me? Quitting smoking is getting easier and easier. With vaping so readily available, what are you waiting for? At least give it a try. Let’s talk a bit about tobacco products. You’ve probably observed the negative ads about smoking tobacco. Yes, that is a very real risk with smoking but do you truly understand why? We’ll try to explain. Cigarettes contain about 7,000 chemicals. We won’t name them all, but one of them is Tar (not the stuff that roads are made of). 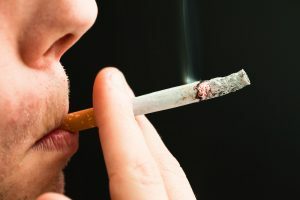 Tobacco tar is a resinous, partially combusted particulate matter produced when tobacco is burned along with other plant materials when smoking. Tar is a toxic sticky substance. It damages the lungs through various biochemical and mechanical processes. Tar damages the mouth by rotting and blackening teeth. It damages the gums and weakens the taste buds. Tar also contains carcinogenic agents (cancer causing). Tar, when in the lungs, coats the cilia (hair-like strands that provide mobility of fluids). Think of them as a broom keeping the lungs clear. Smoking causes cilia to stop working and they eventually die. This gives cancer a chance to develop since the toxic particles in tobacco smoke are no longer trapped by the cilia. They actually enter small pockets (alveoli) in the lungs. Eventually, the alveoli can no long exchange gases which cause difficulty in breathing and shortness of breath. Cancer is ugly. Life is beautiful. If you smoke tobacco, consider trying vaping. There are hundreds of flavors, the juices are organic and pure, the colors are organic vegetable colorings, and the “smoke” is vapor (similar to steam). Now more than ever before, vaping is a lifeline to smokers who are desperate to quit. Millions have successfully stopped smoking by vaping. Visit our vape shop in Tyler, TX to learn more.